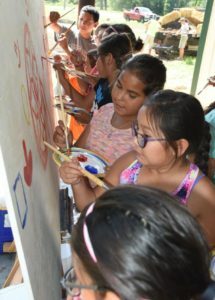 In the summer of 2016, ArtsLink partnered with the Little Eagle Arts Foundation (LEAF, Wisconsin Dells) for Ahuchoga: Blue Wing’s Legacy Project. The central activity was to create a community mural inspired by an important historical event in Reedsburg. 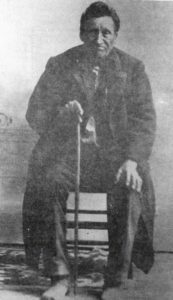 In 1873 members of the Reedsburg community gathered at the depot to stop the relocation by federal agents of all Ho-Chunk including the beloved chief, Ahuchoga, or “Blue Wing”, and his family. 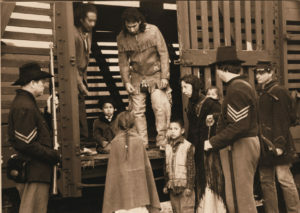 It is believed that this action may have contributed to ending the US Government’s inhumane relocation policy. 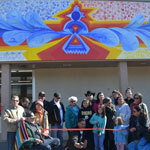 The Ahuchoga: Blue Wing’s Legacy Project was crafted to encourage cultural education and exchange. Supporting activities included educational programming at the Reedsburg Public Library, a Native Art Market in Harvest Park and a pop-up gallery featuring the work of First People’s Fund Fellow Wesley May. It was supported with a generous grant from the First Peoples Fund, with additional support from the Sauk County U.W. Extension Arts and Culture Committee and the Wisconsin Arts Board with funds from the National Endowment for the Arts, and the Ho-Chunk Nation of Wisconsin. 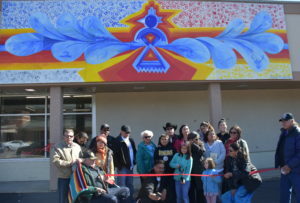 The symbolic mural depicts Chief Ahuchoga’s legacy as a kind and gentle man that has brought people together from the past, present and future. Ahuchoga, which in English means “Blue Wing” is drawn out in feathers and within each of the 12 feathers are the clans of the Ho-Chunk. These keep the Ho-Chunk centered on who they are as human beings. At the heart of the mural is the symbol for Ahuchoga. Ancient rock writing found in Wisconsin inspired this symbol which also appears on the Blue Wing memorial marker at the Blue Wing Cemetery in Tomah, WI. Extending out is a red banner, symbolizing the blood that is the common tie among all human beings. On the right side of the mural is the traditional home of the Ho-Chunk and on the other is an empty train leaving Reedsburg. The handprints found in each corner represent the community coming together to commemorate this historic event and our shared connection to Mother Earth. The Reedsburg train depot scene from the independent film ‘”Thunder in the Dells” produced by Lance Tallmadge. Ho-Chunk youth visiting from Tomah, WI practice their painting skills prior to helping complete the Community Mural.